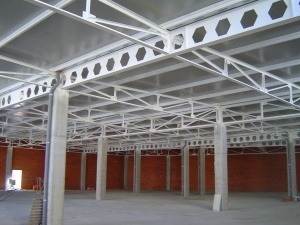 Regarding the Passive Protection and particularly the protection of the metallic structure, (steel loses half of its mechanical resistance to 500 ºC) we must protect it to the fire during the time enough to evacuate, protect the properties and allow the security teams enter to the building to extinguish and control the fire without the collapse of the bearing structure. – Protections with non-reactive elements: Mortars or Panels. – Protections with reactive elements: Intumescent or fireproof paints. The difference between these two types is that the first one protects the fire without a significant alteration in these materials. In the case of Intumescent Paint, when the temperature is high, there is a chemical reaction that releases an expansive foam of elements rich in carbon giving to the steel the necessary thermal insulation for the required time. This thickness depends on the mass of the profile, the surface exposed to the fire and whether the profile is open type “I” or “H” or closed square or circular tube type (the last one have a different fire behavior than the first one). A few years ago, the test procedure for both types of protections was the same, UNE ENV 13381-4 “Tests to determine the contribution to the fire resistance of structural elements. Part 4: Protection applied to steel elements “. But actual experience determine that these types of reactive coatings require a special standard tests better suited to their particular circumstances since they generally begin to react at a temperature of 200 ° C, whereas non-reactive protections do so from the outset. That is why since 2011 the new standard to test the resistance to fire of reactive protections is the UNE ENV 13381-8 “Tests to determine the contribution to the fire resistance of the structural elements. Part 8: Reactive protection applied to steel elements “. This point is important when choosing a brand of intumescent paint, since some are still tested under the old standard and its approval is invalid. Another important aspect is that not all primers are compatible with the intumescent paint and there could be incompatibilities and many problems. Last but not least, intumescent paint is an open-pore product and over time is absorbing moisture by capillarity, losing its intumescent properties. It is essential to protect it from moisture with a compatible finish Enamel Sealer, which at the same time gives it better appearance and a hardness surface. Mercor Tecresa has developed a water based intumescent paint called Teclack. We recently presented it in another post but we would like to highlight some of its advantages over other intumescent paints. – It allows to realize protections with Intumescente Paint of profiles of high massiveness (up to 440 m-1) while the others usually reach a maximum of 300-340 m-1. (This is important in lattice trusses, for example). – They have a high percentage in solids (about 70%) which gives us excellent performance per square meter. (Less expense of painting). – We can achieve 90-minute fire protections using the half thickness of many other intumescent paints.